Natives often fear labor market competition of foreigners, as they may induce declining wages and rising unemployment as in the case of natives and immigrants being substitutes. However, there is also the potential that they are complements, producing positive wage and employment effects. This issue is examined in a framework with two types of labor, such that low qualified native and immigrant workers (blue collar), although substitutes for one another, are potentially complements to high qualified native workers (white collar). This is thought to accurately reflect the past West German immigration experience. 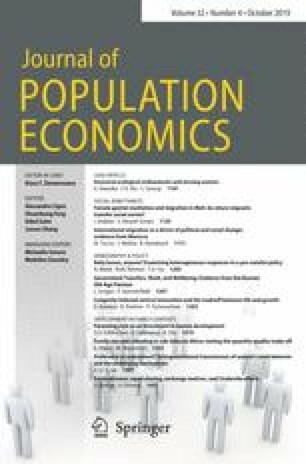 Examining the wage functions of white and blue collar natives in a random effects panel model using a vast sample of micro data, we actually find that foreigners negatively affect the wages of Germans on the whole. Relatively small gains are made by white collar employees with less than 20 years experience, but these are outweighed by the larger negative effects experienced by blue collar employees. We wish to thank Don DeVoretz, Riccardo Faini, Andrea Ichino, and participants at the following 1993 conferences for their valuable comments where drafts of this paper were presented: “The Economics of International Migration: Econometric Evidence” at the University of Konstanz, “Internationale Migration und Arbeitsmarkt” der Schweizerischen Gesellschaft fur Statistik und Volkswirtschaftslehre at the University of St. Gallen, “Adjustment Policies in Previously Centrally Planned Economies: Which Lessons from Developing Countries Experiences“ at the University of Brescia, and “Congress of the European Society for Population Economics” in Budapest. Substantial revisions were made following the valuable suggestions of two anonymous referees and the special issue editor Wolfgang Franz, for which we are grateful.